Barbies from my personal collection. That Barbie case is from the Waseca Coast-to-Coast hardware store, c. 1981. The hardware store had a toy aisle. Barbie controversy rages again. This time, Sports Illustrated is getting flack for putting the American icon on the cover of the swimsuit edition. I played with Barbies almost incessantly at times, but I like to think I grew up with a fairly healthy body image. 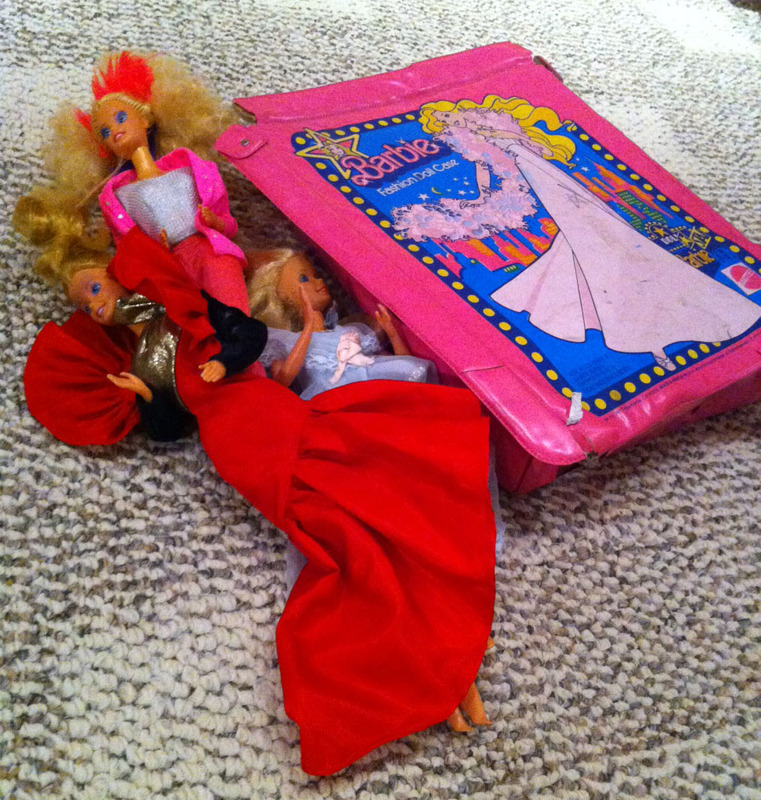 As a lover of stories from my earliest days, Barbies helped me play out stories from my imagination. Now that I think about it, maybe I did make up stories when I was younger! (If you know me, you know how I feel about fiction and my inability to write it). I just didn’t write them down; Barbies acted out my stories. Did I miss a calling for a theater career? Here’s an excerpt that didn’t make it into my book. I have several of these. Maybe I’ll let them see the light of day here and there on the blog. My book is 200 pages; there’s probably an equal amount that didn’t make it in. Heidi and I met in first grade, in Mr. Hoelmer’s classroom. She brought the best show-and-tell ever to class—an actual baby. Marian Keller placed newborn Emily in Heidi’s arms as we all sat in a circle and aaaahed and cooed. On Saturdays, Dad used to bring me and my Barbies to Heidi’s house on the shore of Loon Lake. Heidi always requested that I bring my army of Barbies to her house because she had none. We’d run up to her room, she ahead of me on creaky wooden stairs, her trademark chestnut braids hitting her back. Sitting on the floor cross-legged, we dressed and undressed the Barbies, combed their hair, made them smooch with the one and only (and very lucky) Ken. At the time, Heidi’s little brother, Eric, was terminally ill with a rare disease, sequestered in a hospital room somewhere up in the Cities. But we could forget that for at least a little bit while we played. Now, with Heidi waiting for me at the end of the driveway, she’s returning the favor. How did she return the favor? That’s an entire chapter. It needs some more work; there’s a reason it didn’t make it into the book. Someday maybe you’ll find out!